Meatball Spot was the city’s hotspot, as the local eatery held a large celebration in honor of Meatball Spot Day at Town Square Las Vegas, featuring guests and entertainers from all-over the Strip on Saturday, March 16, 2013. 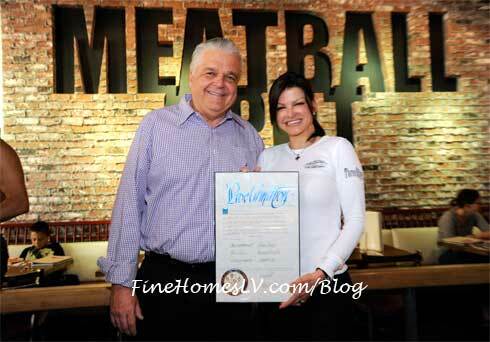 The festivities kicked-off with a proclamation of “Meatball Spot Day” in Clark County by Commissioner, Steve Sisolak. Receiving the restaurant’s proclamation was “Top Chef” Carla Pellegrino. After Sisolak’s ceremony, FOX 5 “MORE” show host, Jason Feinberg, took over Meatball Spot Day as he emceed Meatball Spot’s first annual charity meatball eating contest. Featuring local talents: JC Fernandez of MIX 94.1, Juan DeAngelo and Jon Howes of Chippendales, Mariah of FANTASY, Mark Shunock of Rock of Ages, comedic hypnotist, Marc Savard, and Tacos & Tequila Chef, Saul Ortiz, the contest commenced in an intense round of entertainers and the general public. After noshing on six classic meatballs and sauce, Chippendales star, Jon Howes, came out victorious, finishing all six meatballs in two-minutes, 37-seconds. Howes won a monetary donation on behalf of ForgetCancerNow.com, in memory of Chippendales cast mate Jaymes’ father.